in looking for ways to find it. and a fulfillment of a heart’s desire. 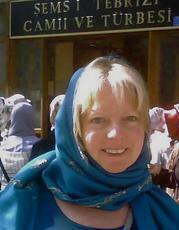 Savarna has much experience in healing, counseling and teaching. Exploring Holistic Heath was an early interest. In the 1970s she began her study and practice of yoga and contemplative Christianity, took her first class in hypnotherapy, completed a Holistic Health training program and worked as a Holistic Health Educator and Massage Therapist. Working with children who did not speak led her to appreciate the richness of non-verbal communication. Exploring their drawings opened the way to study the power of symbol and image to communicate. She developed a BA program in Art Therapy at University of California, Santa Cruz and in 1983 graduated with honors. A Masters degree in Transpersonal Psychology allowed her to study the workings of the mind and heart and explore ways people cope with challenge. Focusing on the Ways People Pray, she was one of the first to do graduate work in psychology on the subject of prayer and won honors in this study in 1988. Nineteen years experience working as a hospice chaplain has offered incredible lessons about death and life. Being a member of an Ethics Board for end-of-life issues and her on-going studies in inter-religious dialog continue to enrich perspectives on what is universal in the human experience. Savarna presents Partners in Caring workshops to clergy and faith leaders on end-of-life issues as well as offering support to hospice staff members. Savarna has been an instructor for Transpersonal Hypnotherapy School and currently teaches a specialized form of hypnosis for The Newton Institute. In depth study and experience in hospice care, end of life issues and providing spiritual care for diverse populations 1999- present. Alliance Trainer for the school of Hypnoenergetics- Past Life Regression.